I was very excited to be notified by email that I was selected to participate in the blog tour campaign by Mom Central on behalf of American Greetings PhotoWorks and received a free photo book to facilitate my review. The Photo Books were baby themed and I picked the People Who Love You book. 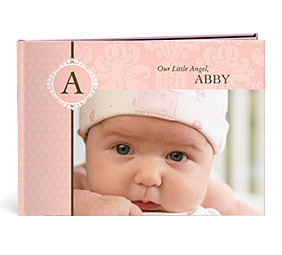 You choose and make your book on their site and www.PhotoWorks.com This book retailed for $39.95. After uploading my pictures to an album, I then organized them on each page and got to write a caption/text. It was very neat because sometimes you could write big captions and I would write a story about the picture or the special bond Sadie had with them. It was very simple to do and you get to preview each page before you buy it which is nice as you see what you are going to get and have the option to edit if you are not happy with the finished product. It takes a little time to do but so worth it and I can’t wait to receive my book. It is a very special book for Sadie to keep for years to come.